Jason May, Bruce Benroth, Nicole Scott, Kyle Benroth, Todd Benroth and Heather Jordan partake in the grand opening ribbon cutting for Bruster’s Car Wash at 940 Bellefontaine Ave. in Lima. LIMA — Six months after an unidentified arsonist burned down the former 4 Seasons Car Wash at 940 Bellefontaine Ave. in Lima, the Benroth family officially opened Bruster’s Car Wash, Monday. The previous building was set on fire April 17, causing over $400,000 in damages. The fire was caused by an arsonist who put a container of accelerant against the wall of the car wash, ignited it and left, said Lima Police Department Investigator Toby Jenkins. The Blue Ribbon Arson Committee will award $5,000 to anyone who can provide information that leads to a conviction of the unidentified arsonist. “Whoever did this absolutely changed our lives quite a bit, and it’s just been a humbling experience,” said co-owner Kyle Benroth. The Benroth family said that they were extremely grateful for the support of the community and their contractors and insurance company that expedited the process of rebuilding. Bruster’s Car Wash, which is owned by Todd Benroth, Kyle Benroth and Bruce Benroth, have been in the express washes business since 2014. They own four locations: Eastown Road in Lima, Bellefontaine Avenue in Lima, Roosevelt Boulevard in Middletown, and Yankee Street in Dayton. The Benroths said they are excited to have the location on Bellefontaine up and running. Bruce Benroth said he looks forward to the future of the business and is confident that the company will remain strong. From 7 a.m. to 10 p.m. Tuesday, 50 percent of the revenue will be donated to the The Ritz to help Lima-area breast cancer survivors. There will be a Hot Fire sale Oct. 23-25 where customers can get to the top wash for $5, a $5 discount. 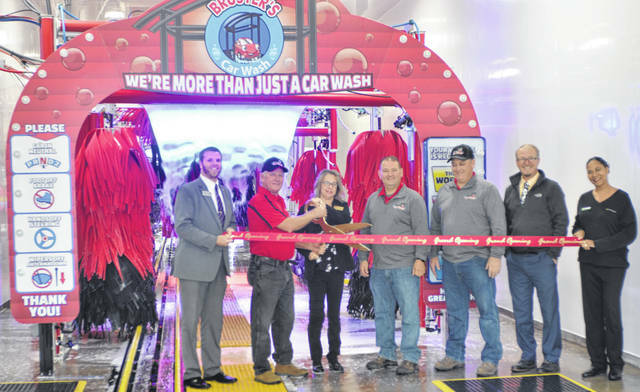 https://www.limaohio.com/wp-content/uploads/sites/54/2018/10/web1_Bruster-s-Car-Wash.jpgJason May, Bruce Benroth, Nicole Scott, Kyle Benroth, Todd Benroth and Heather Jordan partake in the grand opening ribbon cutting for Bruster’s Car Wash at 940 Bellefontaine Ave. in Lima.